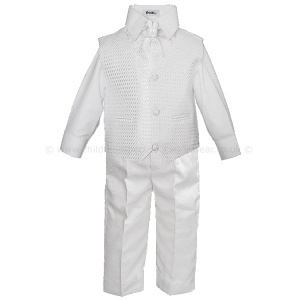 Boys white 4 piece waistcoat suit for baby boys, toddler or older boys. The perfect suit for many special occasions including a christening, wedding or communion. Waistcoat: White waistcoat with a diamond self-pattern on front with silver flecks, fully lined, double pockets, 3 centre buttons, adjustable strap/buckle on back for a perfect fit. Trousers: White trousers, double pockets, belt hoops, elasticated on rear. Cravat: White cravat with matching diamond self-pattern with silver flecks and an actual diamante in the centre, velcro fastening at the back, complimenting the suit perfectly. 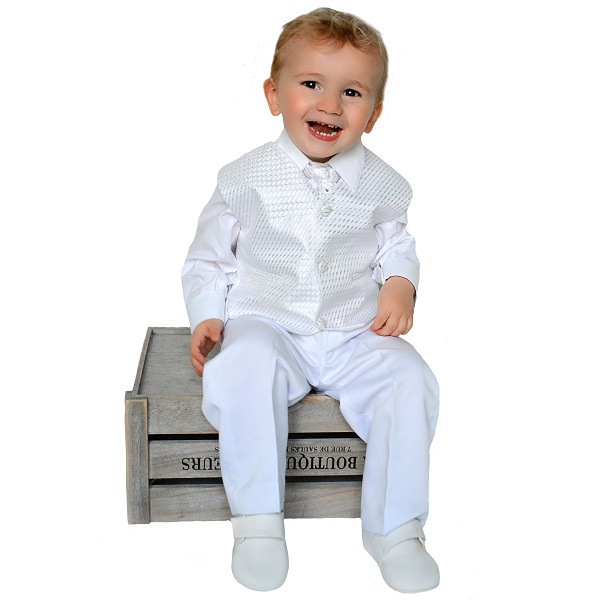 This boys white suit will make him look like the perfect handsome gentleman at special occasions. The measurements in our guides are of the actual items and not the body, so it is best to measure your child's current clothing (eg. shirt, shorts, in inches or cm) and then compare with our measurements. 0-3 Months 20.5cm / 8" 35.5cm / 14" 41cm - 45.5cm / 16" - 18" 45.5cm / 18" 51cm / 20" 16.5cm / 6½" 20.5cm / 8" 24cm / 9½"
3-6 Months 23cm / 9" 38cm / 15" 41cm - 45.5cm / 16" - 18" 49.5cm / 19½" 57cm / 22½" 18.5cm / 7¼" 23cm / 9" 27cm / 10½"
6-9 Months 24cm / 9½" 39.5cm / 15½" 43cm - 48.5cm / 17" - 19" 56cm / 22" 58.5cm / 23" 20.5cm / 8" 24cm / 9½" 28cm / 11"
9-12 Months 27cm / 10½" 42cm / 16½" 43cm - 48.5cm / 17" - 19" 58.5cm / 23" 61cm / 24" 20.5cm / 8" 27cm / 10½" 29cm / 11½"
12-18 Months 28cm / 11" 43cm / 17" 45.5cm - 51cm / 18" - 20" 61cm / 24" 63.5cm / 25" 23cm / 9" 28cm / 11" 30.5cm / 12"
18-24 Months 31cm / 12" 47cm / 18½" 45.5cm - 51cm / 18" - 20" 61cm / 24" 66cm / 26" 25.5cm / 10" 30.5cm / 12" 30.5cm / 12"
34cm / 13½" 51cm / 20" 48cm - 53.5m / 19" - 21" 62cm / 24½" 67cm / 26½" 27cm / 10½" 34cm / 13½" 32cm / 12½"
3 Years 37cm / 14½" 56cm / 22" 48cm - 53.5cm / 19" - 21" 63.5cm / 25" 68cm / 27" 31cm / 12" 37cm / 14½" 32cm / 12½"
4 Years 44.5cm / 17½" 63.5cm / 25" 51cm - 56cm / 20" - 22" 67.5cm / 26½" 73.5cm / 29" 32cm / 12½" 39cm / 15½" 32cm / 12½"
5 Years 45.5cm / 18" 65cm / 25½" 53.5cm - 58.5cm / 21" - 23" 70cm / 27½" 76cm / 30" 33cm / 13" 41cm / 16" 33cm / 13"
6 Years 49cm / 19" 68cm / 27" 53.5cm - 58.5cm / 21" - 23" 71cm / 28" 76cm / 30" 34cm / 13½" 42cm / 16½" 33cm / 13"
7 Years 53.5cm / 21" 73.5cm / 29" 56cm - 61cm / 22" - 24" 71cm / 28" 77.5cm / 30½" 38cm / 15" 45.5cm / 18" 35.5cm / 14"
8 Years 57cm / 22½" 77.5cm / 30½" 56cm - 61cm / 22" - 24" 72.5cm / 28½" 84cm / 33" 39.5cm / 15½" 49cm / 19" 35.5cm / 14"
The suit I bought for my toddler was perfect. True to size. Really pleased with this little suit... the photo doesn't do it justice... our little man looked great in it.. comfy material too! My little godson was gorgeous on his Baptism day in this! Pictures don't do it justice it's very cute. Great quality & washes up well. Perfect for a very special day. Really nice suit, fantastic quality and fits my son great. Delivery was very quick, a credit to this company.